Icon player Vinesh Phogat and Abdurakhmonob Bekzod won the last two bouts as UP Dangal edged out Delhi Sultans 4-3 to enhance their knock-out stage chances at the Pro Wrestling League on Monday. Icon player Vinesh Phogat and Abdurakhmonob Bekzod won the last two bouts as UP Dangal edged out Delhi Sultans 4-3 to enhance their knock-out stage chances at the Pro Wrestling League on Monday. Down 2-3 in the seven contest duel, Vinesh and Bekzod delivered to ensure UP maintain their unbeaten run. Delhi have now lost all their three ties and are virtually out of semifinals reckoning. The 2017 Commonwealth champion Vinesh, who came into the tie without dropping a single point, steamrolled Maroi Mezien 15-0 in the 50kg bout via technical superiority to make it 3-3 for Dangal. The Asian championship gold medalist then hammered Vinod Omprakash 9-0 in the 74kg bout to seal the issue for UP. In the fifth bout of the day, Jamalladin Magomedov of Azerbaijan registered a comfortable 6-2 victory through pinfall over India's Hitender in the super heavyweight clash of the day, to keep UP stay afloat in the tie. Earlier UP won the toss and forced World Champion Haji Aliev out of the equation; Delhi Sultans, on the other hand, decided to block Geeta Phogat. 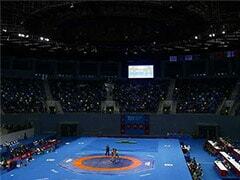 Delhi logged in the first win of the day, with Sandeep Tomar beating compatriot Nitin Rathi. Nitin started on a strong note as he raced to a 5-0 lead in the opening period. But the 2016 Asian Championship gold medalist, who came into the bout undefeated, launched a great comeback to tie the score 8-8 at the end of regulation time in the 57kg bout. The referees awarded the match in Nitin's favour, thanks to his big-scoring move in the second period. European Championship silver medalist Zsanett Nemeth of Hungary, however, restored parity for UP. She overcame Samar Hamza of Egypt 3-2, via a fall in the 76-kg women's event. Nemeth, who started as a strong favourite, was behind 1-2 for the most part of the bout but she turned it around in style to steer her side to victory. 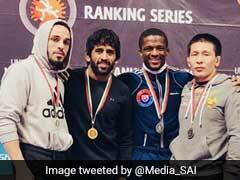 World Championship bronze medalist Alborov Aslan of Delhi Sultans then defeated Junior National Championship silver medalist Vicky 7-1 in a lop-sided affair to send the home team 2-1 ahead in the tie. Commonwealth champion Sangeeta Phogat caused the biggest upset of the tournament, getting the better of World Champion Vanesa Kaladzinskaya 7-4 in the 57-kg women's contest.